While working in London as a secretary to Edward Johnson, Edison's chief engineer, Samuel Insull had memorized Edison's European finances. Upon arrival in America, he was able to find $150,000 savings for his new boss his first day on the job. This British-born businessman made cheap public utilities a reality for Americans, bringing them electricity and an improved quality of life. 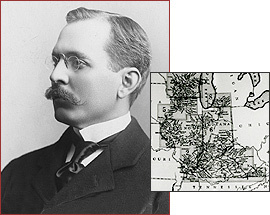 Samuel Insull was born in London in 1859 and emigrated to the United States at the age of twenty-two to become secretary to a man he worshipped, Thomas Edison. After winning the inventor's complete confidence, the young Englishman went to Schenectady, New York, to run an electrical factory, with Edison's encouragement: "Do it big, Sammy... Make it go." It was a beginning from which General Electric would grow. When a company merger pushed Edison out in 1892, Insull left too, for the bustle of Chicago. In Chicago, Insull took over a power station, one of about 20 that served just 5000 customers in a city of a million people. Electricity was a high-cost luxury. It was also a risky business venture, since the product is manufactured, transported, distributed, and consumed all at the same moment, and can't be stored. Risking a personal loan of $250,000, Insull bought out his competition, then built the largest power plant in the world, the Harrison Street Station. To keep it running, Insull sold electricity to anyone he could. He saw that he could charge different prices to customers who used power at different times. By seeking those who would use electricity outside of the most popular evening hours, he could build a larger user base, and price the utility low enough for small businesses and households to afford it. Insull increased demand by wiring homes cheaply, giving away electric appliances, and cutting rates further. His businesses blossomed. By the end of the 1920s, Insull's utilities served more than four million customers in 32 states, and were valued at nearly $3 billion. To pay for expansion, Insull had sold low-price bonds and stock. Over a million middle-class Americans bought in -- but their investments were made worthless by the Great Depression. Overnight, Insull went from a hero on the cover of Time magazine to the villain who had stolen the people's money. In 1932, he owed $16 million dollars more than his worth -- "too broke to be bankrupt," according to one banker. Charged with fraud, Insull was tried in 1934 and acquitted of the charges. But his reputation was destroyed, and he and his wife, Gladys, left the country for good. Four years later, the man who brought the American masses a new source of energy and changed the way they lived and worked would die of a heart attack in the Paris subway.